It's Needle and Thread Thursday time! I've been working on a brand new quilt for the past couple of days, and I am in love with the way the colors glow against the Kona Coal background. I designed this one to look like funky hanging doorway beads, and I'm calling it Boho Beads. For those who are wondering, I will be releasing this pattern! 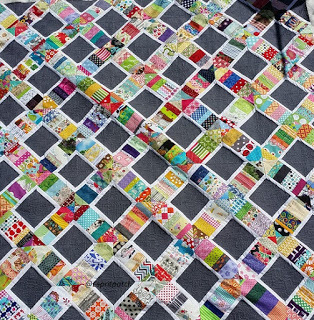 Because I just can't help myself, take a look at this close up of the yummy fabrics in this quilt. It's so hard to resist a stack of rainbow goodness. Before I can proceed any further, a trip to the store is in order for more starch (hence the lack of pressing in the picture), but I can't wait to get this one quilted! Without further ado, it's time to check out the inspiring projects from last week's party (and there were plenty!). Celine at Espritpatch linked up this scrappy beauty. 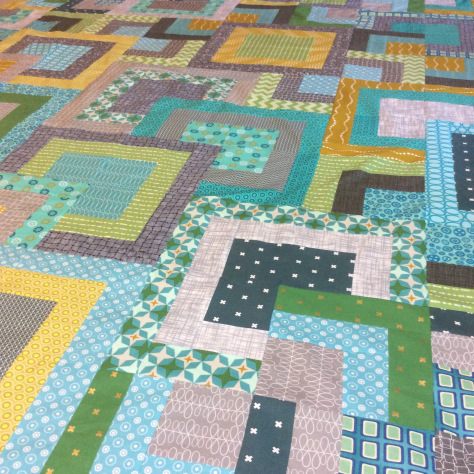 Lori at Crossquilt showed off this pretty Stacked Squares quilt. Love those colors! and Diana at Red Delicious Life shared a cathedral window bed runner in a really unique color palette. Okay friends! 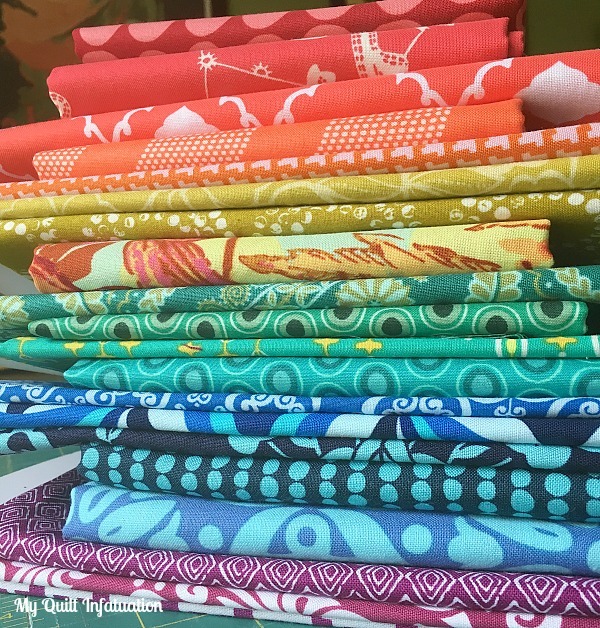 It's time to share the latest from your sewing space. Let's party! OMGosh Kelly!! I LUV this Boho Beads!! I just pulled Xmas fabric for a holiday Baubles quilt...and now I want to rush that one so I can make a Boho Christmas one! Super groovy girl! I love the striking Boho beads against the dark background, Kelly - beautiful!!! Very fun quilt! A very "groovy" pattern as the would have said back in the day. Loving the Boho Beads! And I love how the fabrics pop on that dark background. I love your new quilt pattern! The dark gray with the bright fabric looks incredible! 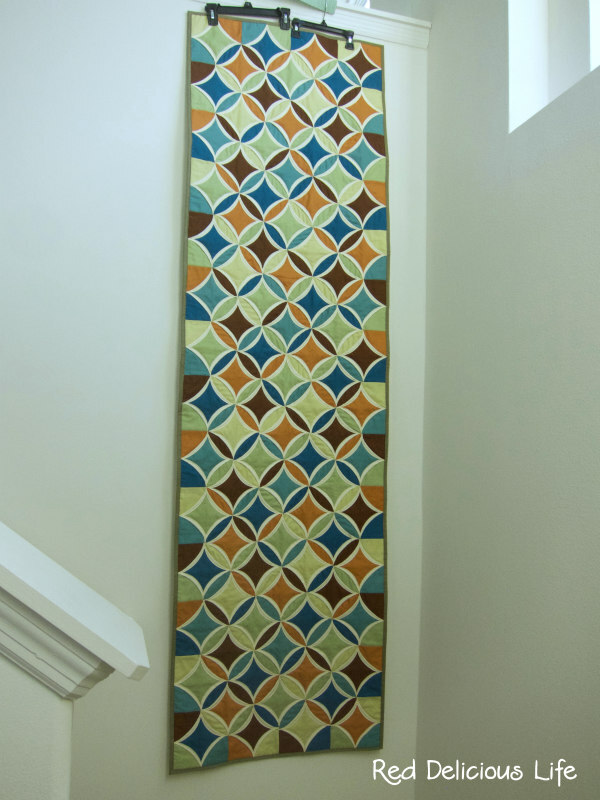 So many great color schemes would work with your pattern!! I'd love to see one with a bright background (like purple). 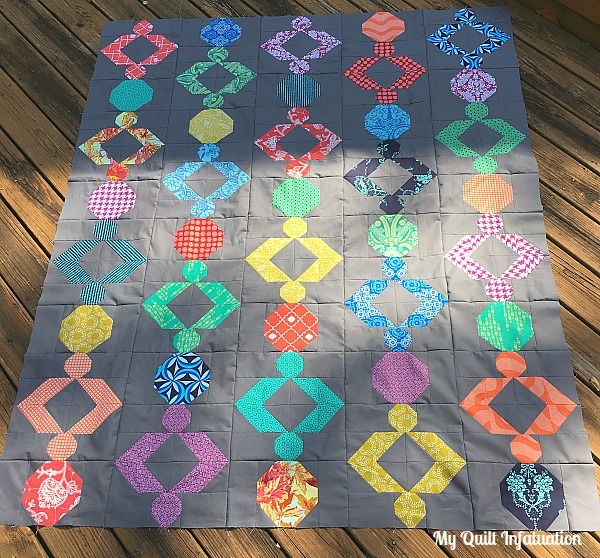 I totally see those hanging beads with this quilt! You nailed it! I really like those gray backgrounds in quilt tops. Fabulous design and the block pops on the grey fabric. Really love the fabrics you used in this project. Just so bright and cheery against the dark background. Great pattern. I'm amazed at how creative you are and all the patterns you've been releasing lately. I love the rich colors and prints in your Boho Beads. The pattern takes me back to the 60s and 70s for sure!